At long last, an outfit post! Here's what I wore to work today. It's pretty basic, but I thought the leopard belt and wine-colored tights added just enough interest. Now I'm off to bed! cute 70s style! i dig the necklace! Really like this outfit, esp the accessories! i love this outfit :) the skirt and belt are really cute. the skirt is pretty sweet!!! Very cute! Love the denim skirt with those tights!! I absolutely adore this outfit!! 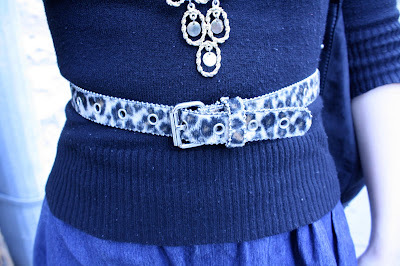 I love the leopard belt with the purple tights... it is such a great combination together with the skirt and sweater. Oh cute! I quite like this! Great outfit! I love the tights. super cute outfit. I just love the look for thights and a skirt for the fall. And those purple thights of urs are awesome! Love the little details. Question: How do you avoid snags on your tights like these? I've had a couple pairs of tights like these ones but inevitably they get a horrible snag that I don't even notice until I'm taking them off at night. You look so elegant! Love your tights and the way you updated the basic turtleneck! absolutely lovely! very chic with the addition of colored tights :) have a great weekend! awesome outfit! love the tights! such a perfect fall look. turtlenecks, textured tights and earthy tones- adorbs! holy cow! you look awesome! I get so jealous when you wear those adorable Payless booties! So cute! Loving this outfit! Just discovered your blog today and I really admire your style.